One year ago in January, the Israeli government passed a decision agreeing to historic changes at the Western Wall. The Kotel agreement, as it is called in Israel, was a hard-won compromise we achieved after three years of dogged negotiation. Since then, none of its provisions were implemented and the reality is that Women of the Wall are subject to harassment that has extended even to humiliating body searches. Despite this experience, we believe we are headed to the Promised Land. Last week, the Supreme Court ruled that the government has failed to enact its own decision and has only until February 1 to provide ‘good cause’ showing why women cannot pray with Torah scrolls at the Kotel. In addition, the court ruled that the authorities must immediately cease and desists from body searches. Prime Minister Netanyahu: With or without you, we will arrive at the Promised Land of equality and freedom of expression for all. 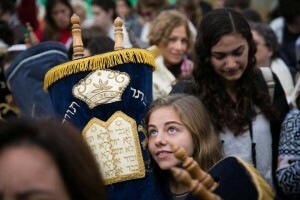 We can already see that Israel will soon be a country in which any young girl knows that, like her brother, she can celebrate her Jewish coming-of-age by reading from a Torah scroll at the Western Wall. PLEASE JOIN US ON AT 7AM, THURSDAY JANUARY 19th AT THE KOTEL.